Albion News and Petersburg Press were among the newspapers earning top awards at the 2009 Nebraska Press Association (NPA) Convention held last Friday and Saturday, April 18-19, in Kearney. On Friday, both newspapers received a top award from the Nebraska Corn Board for production of the Best 2008-09 Nebraska Corn Tabloid for weekly newspapers over 1,500 circulation. 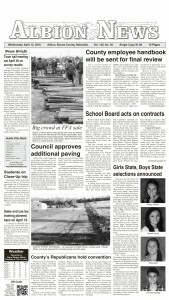 This special section, the Boone County Corn & Grains Outlook, was produced in March, 2009. Datrece Voichoski created the advertising, Jim Dickerson wrote the local news articles and Julie Dickerson designed the cover and composed special section pages. Both newspapers also received awards at the NPA Better Newspaper contest final banquet on Saturday night. The Albion News received two first place awards and two second place citations in competition with other weekly newspapers of 1,500 to 2,800 circulation. 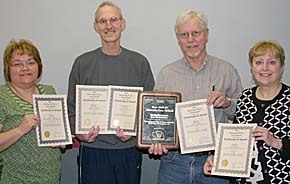 First place awards were for a computer graphic on the growth in Boone County’s property valuation, produced by Julie Dickerson; and for an agricultural advertisement produced for White Star Oil Company by Datrece Voichoski. Second place awards were received by Joe Flanagan of the Albion News in the Best Sports Column contest, and by the Albion News staff for a special section last May on the VeraSun Energy ethanol plant. The Petersburg Press received a third place award in competition with newspapers up to 1,000 circulation. The award was for a signature page advertising Petersburg’s Carnival Days, produced by Datrece Voichoski.